Dilute Chemical Generators for Lower Capital Cost. The CD2D generators utilize Electricide-DC (7.5% sodium chlorite) and Electricide-DA (9% hydrochloric acid) and range in capacity from 40-800 g/hr (2.4 - 42.4 ppd). These chlorine dioxide generators are ideal for applications with low water flow and therefore small ClO2 dose and reactant chemical consumption. Concentrated Chemical for Lower Running Cost. The CD2C generators utilize Electricide-P1 (31% sodium chlorite) and 33% hydrochloric acid (and dilution water) and range in capacity from 150-10,000 g/hr (7.9 - 528 ppd). Flexible purchase arrangements. Dioxide Pacific can provide the generator and dosing system as a capital purchase or under a rental agreement. Rental involves a fixed monthly fee to cover operation and maintenance of the plant. Ownership remains with Dioxide Pacific. One advantage of this method is that Dioxide Pacific is responsible for the ongoing performance of the plant. Submerged, water flushed reactor. The chlorine dioxide reactor is submerged inside the by-pass water in a PVC chamber. By-pass flow is on the outside of the reactor so any leaks from the reactor are captured in water and flushed immediately away into your process. There is no way a leak of chlorine dioxide gas can occur from the reactor chamber. This represents the highest safety available. Wall mount backboard with Fiberstrut vinylester fixings for optimal chemical resistance. Easy to install with long life and resistance to corrosion. Flow monitoring for dosing pumps. Chemical is always being dosed at the correct rate for the reaction. If one chemical has missing flow for x pulses, the generator is stopped and an alarm raised. Inbuilt calibration cylinders. The generator can be accurately calibrated without operator exposure to either acid or chlorite. Just open and close a few valves for this procedure. Pulse frequency controlled dosing pumps. Standard high quality metering pumps have power on all the time and are speed controlled via pulse frequency for accurate turndown of up to 200:1. By-pass Dilution. Chlorine dioxide generated at the reactor is immediately diluted with by-pass water to less than 3,000 ppm, which is safe for transportation to the dosing point. Optional remote internet access to plant. View the operating status of the plant, receive email alarms and start/stop plant items. This feature minimizes downtime and provides the ability to fault find without having to travel to site. CD2C generator has pre-dilution of acid. Concentrated acid is automatically mixed with water to dilute to the correct concentration. The dilute acid is then dosed with Electricide-P1 at the reactor. This method is safe and maintains less than 2% chlorine dioxide in the reactor. 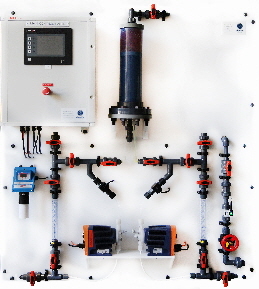 Complete system assembled and ready for quick mechanical and electrical install. You can get running quickly to get benefit from your investment. Please download the CD2D and CD2C brochure for a complete description of all the models available. For more information on acid-chlorite chlorine dioxide dosing systems or to obtain a quotation, please complete the feedback form on our Contact page.